What’s coming up? Let’s dive into the Deeper Waters and find out. The divine council is a theme that occurs from time to time in the Old Testament. When we go to Genesis early on, we can see a few times it takes place in Genesis 1-11. These passages can sometimes be read in the sense of a royal we, but maybe they mean something else. When King Ahab is considering going off to battle and God has in mind to entice him to do it so he will die there, we see a divine council taking place. When we read Psalm 82, we get told about God sitting among the gods and saying to certain people, “I have said that you are gods.” Jesus even quotes this passage in John 10. What is going on in these passages? Is there an Ancient Near Eastern motif that we’re missing? Is the Bible teaching polytheism? Could these passages somehow influence how we witness to Jehovah’s Witnesses and Mormons? After all, Mormons seem to enjoy going to these passages to show a plurality of gods. Are they right? If there is a plurality of gods, how will that help with Jehovah’s Witnesses who are adamant monotheists? Besides, aren’t Christians supposed to be monotheists also? To discuss these passages and how they interact with these groups, I am having a guest come on that many people have requested over the years and he was very willing to come on. We wanted him back in December, but a blizzard came through in his area unfortunately and shut down the power. Hopefully, all will go well this time. My guest will be Michael Heiser. So who is he? Michael S. Heiser (M.A., Ancient History, University of Pennsylvania; M.A., Ph.D., Hebrew Bible and Semitic Studies, University of Wisconsin-Madison) taught at the college level for twelve years before accepting a position at Logos Bible Software with a focus on producing ancient text databases and other digital resources for study of the ancient world and biblical studies. He is now the Scholar-in-Residence at Logos Bible Software (Faithlife Corp.) and a regular contributor to Faithlife’s Bible Study Magazine. He has also published widely in scholarly journals and is a best-selling author. His books include: The Unseen Realm: Recovering the Supernatural Worldview of the Bible (Lexham, 2015); Supernatural: What The Bible Teaches About The Unseen World and Why It Matters (Lexham, 2015); Reversing Hermon: Enoch, The Watchers, and the Forgotten Mission of Jesus Christ (Defender, 2017); Angels: What The Bible Really Says About the Heavenly Host (Lexham, 2018); and the 60-Second Scholar series: Brief Insights on Mastering Bible Study (Zondervan, 2018); Brief Insights on Mastering the Bible (Zondervan, 2018); Brief Insights on Mastering Bible Doctrine (Zondervan, 2018). Heiser advocates that interpreting the Bible in context means reading it in light of the context that produced it instead of Christian tradition or modern thinking. Readers discover a radical new relevance and coherence when they read the Bible through the eyes of its writer. 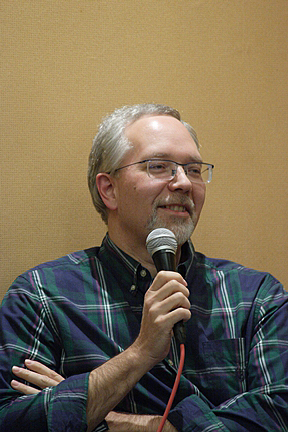 Years ago, this passion for convincing readers of the importance of an ancient worldview prompted Dr. Heiser to create The Naked Bible blog and the popular Naked Bible Podcast. Dr. Heiser’s non-profit ministry (MIQLAT.org) provides translations of his work free of charge in over a dozen languages and has partnered with AllAboutGod.com to create the new YouTube Channel FringePop321, which seeks to engage people attracted to new age and popular fringe beliefs. To that end Dr. Heiser has also written two science fiction novels (The Facade, The Portent) and hosts a podcast dedicated to discussing peer-reviewed research on these subjects (PEERANORMAL). I hope you’ll be joining us for this episode as we talk about these topics. Please also go on iTunes and leave a positive review of the Deeper Waters Podcast. It’s really inspiring to see how many people like the show. Next Next post: Happy 28th Birthday Princess!